Someone gave George Hemphill gave Andrew Bain some tickets to the game tonight. It was the best since their second game against the Yankees this year (when the Nats came back from 9-2 to win 11-9 in the last inning [man, I still love the looks on their faces]). 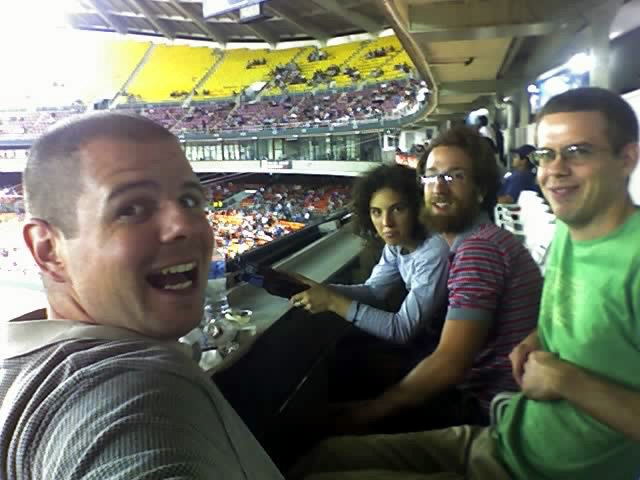 It was Jenn and Jeremy's first Major League Baseball game ever. It went into an extra inning and the Nats won. Man, Phillies fans are whiney. ... George Washington won the Presidents' Race.